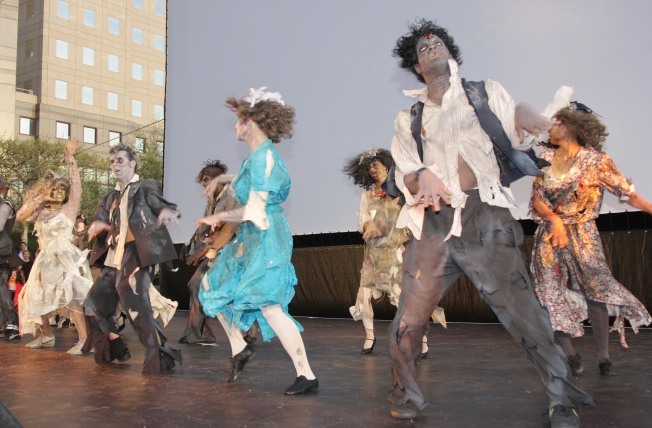 Contestants perform "Thriller" during the 2008 Tribeca Film Festival on April 24, 2008 in New York City. Hoards of dancing zombies descended on Madame Toussauds at Times Square this morning to set the world record for "Most People Dancing to Thriller"....and they did it! The event was organized in collaboration with Madame Toussauds and Sony. Tiphane Thompson, a rep for the world-famous wax museum, reported that they broke the record with more than 75 "enthusiastic Michael Jackson fans. "The previous record was set by a group of 62 zombies in Toronto last year. Before the big dance, participants turned out for lessons on how to do the Thriller dance, got zombie mini-makeovers, and took photos with Michael Jackson (the wax figure, of course). And then, at approximately 10:30am this morning, the classic dance began. Last Saturday, a world-record was broken for most people dancing simultaneously to Thriller, albeit not in the same place. For that event, the LATimes reports "dances in 91 cities in 12 countries took place the same day."